It's a serious work, intended for adults, and has a certain classiness. Bradbury's Fahrenheit 451 (1967) had been recently adapted by director François Truffaut, and invites comparison. Though not a commercial hit, and in spite of an inadequate budget Truffaut's film was mostly wonderful. It has a great performance by German actor Oskar Werner, a superb musical score by Bernard Herrmann, and many fine sequences, particularly the moving finale. Many of the film's visual effects were quite bad but ultimately unimportant if distracting in their awfulness. What counted was that Truffaut understood Bradbury's themes, dramatizing them with the same understanding and passion. The Illustrated Man is stillborn, dead in the water. Lifeless. Fahrenheit 451 tried to compensate its too-tight budget by avoiding costly studio-built sets, instead utilizing existing modern structures and an experimental monorail near Orléans, France. 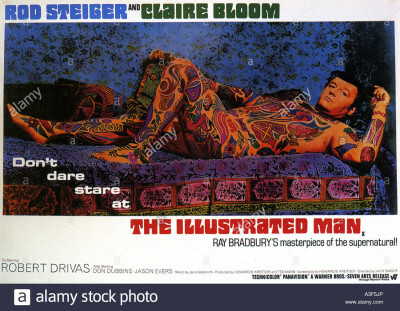 The budget on The Illustrated Man was undoubtedly a bit higher, but the filmmakers make bad choices throughout. Not much else works, either. The design of the skin illustrations is neither period authentic (the story appears set during the Great Depression) nor otherworldly. Instead, they reflect the psychedelic style of the late ‘60s and could almost be set flats on Laugh-In. Transitions from one story to the next are clumsily done. Even Jerry Goldsmith, one of the screen's great film composers, turned in music that at times seems so wrong one wonders if Smight or others overruled Goldsmith's suggestions.